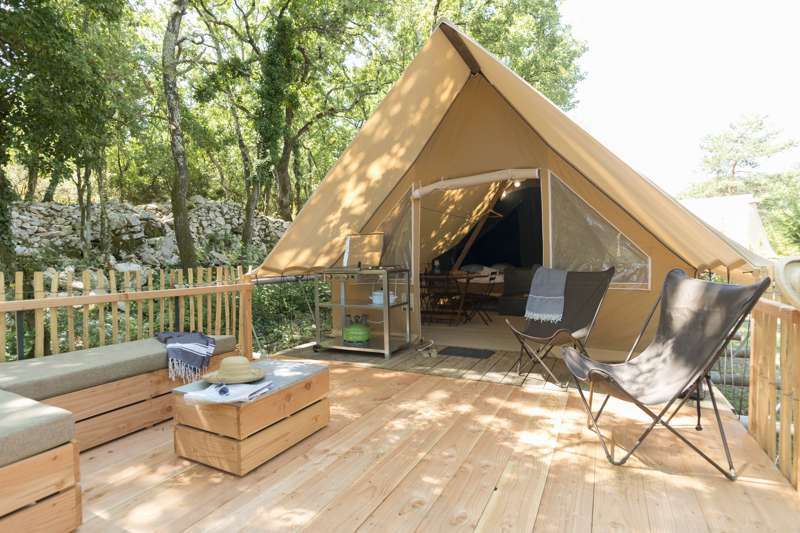 A canvas and timber tent offering the camping experience with all the comforts of home. Sleeps up to five people. 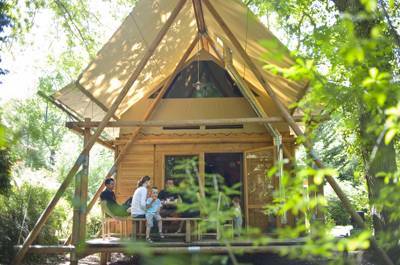 35 m² - 6 people The Huttopia Wood Cabins are made entirely of untreated wood. 30 m² - 5 pers. 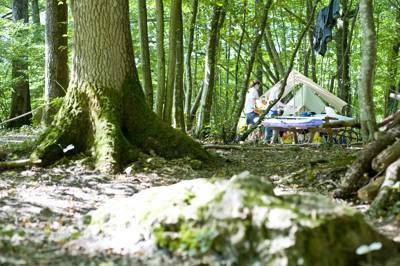 In Huttopia Rambouillet you can lodge together as a family in a hut. 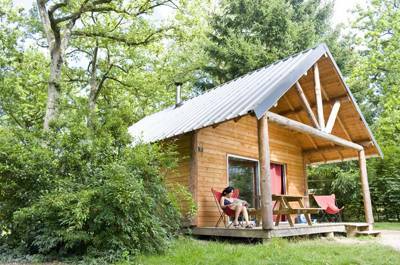 Enjoy an unforgettable holiday escape at Huttopia Rambouillet in a remarkable forest setting that is at once close to Paris and in the heart of nature, with a beautiful natural swimming pool for you to cool off. 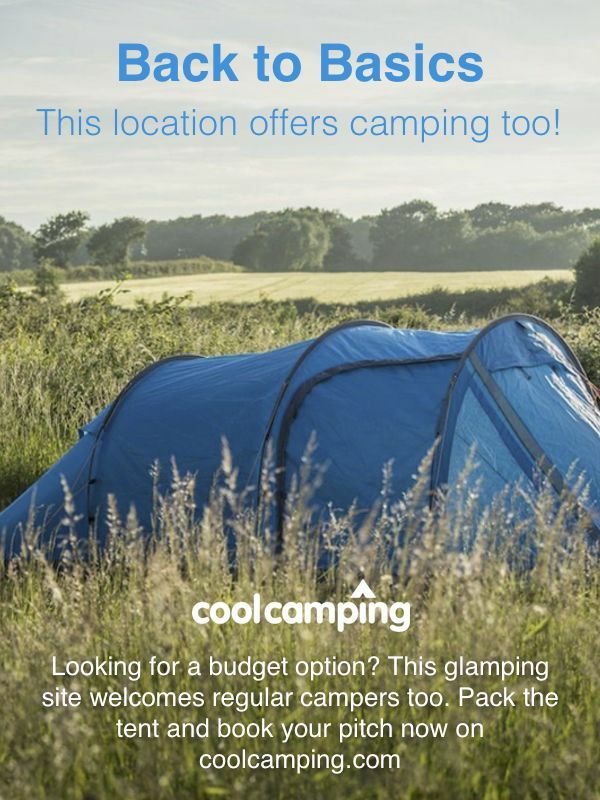 For latest availability and best prices for Huttopia Rambouillet, please use the Date Search above. Excellent shower and toilet blocks, cleaned 3 times a day, including spacious family bathrooms, baby changing and disabled facilities. There is a natural swimming and paddling pool with a pleasant poolside area, café-restaurant (open daily July / August and weekends out of peak season), bar (open until 11pm) and a reception area with a small shop and plenty of tourist information. Swings, playground, table tennis, volleyball and boules, plus an indoor lounge area with board and card games, books to borrow and a television. There is no Wi-Fi on site but a computer with internet is available. No campfires. Go fishing in the Etang d'Or lake, just next to the campsite. For this, you need a fishing permit issued by the French fishing federation but they're on sale at the campsite reception, just ask the staff and they'll sort you out. There aren't any fishing rods for hire though, so be sure to bring one with you. However, they do hire bikes and have a large map showing some of the best local routes. Head into town – the former royal city of Rambouillet – where you can visit Château de Rambouillet (0033 1 3483 0025) or the Palais du Roi de Rome. The former features a magnificent garden and the Chaumière aux coquillages (shell cottage), which is home to one of the most beautiful shell and mother-of-pearl decors in Europe. The café-restaurant opens for breakfast or you can order fresh bread and pastries the evening before, collect it in the morning and eat it back at the tent. Meals generally start at around €10 and there are freshly produced pizzas (made with organic flour and tomatoes) cooked in a wood-fired oven. BBQs are available for anyone to use in the communal areas dotted around the site. From Paris take the A13 and then the A12, then use the N10. Go through Trappes, then Rambouillet and then take the Les Eveuses exit. From here the campsite is clearly sign posted. The nearest train station is in Rambouillet centre, 3 km away. 116 tent pitches, ranging in size and accessibility but there are plenty suitable for motorhomes too. Wood and canvas glamping units are also available.